I was in upstate New York this past weekend and got to hang out with Gouda Brie, her husband Kefalotyri Dunbarton, and their daughter Derby Mimolette, who were visiting from Seattle. We met in Beacon and from there drove up to Rhinebeck to enjoy a day at the Sheep & Wool festival. The weather was crazy: bright and sunny one moment and then, there were flurries the next! Eventually, after enjoying the sheep dog trials, feeding goats, eating pumpkin pie for breakfast and cider doughnuts for lunch, we drove over to visit with friends of Gouda & Kefalotyri in Newburgh. I was sort of a tagalong and I didn’t want to show up empty handed, so I offered up the Sprout Creek Farm cheeses that I had purchased earlier in the day. 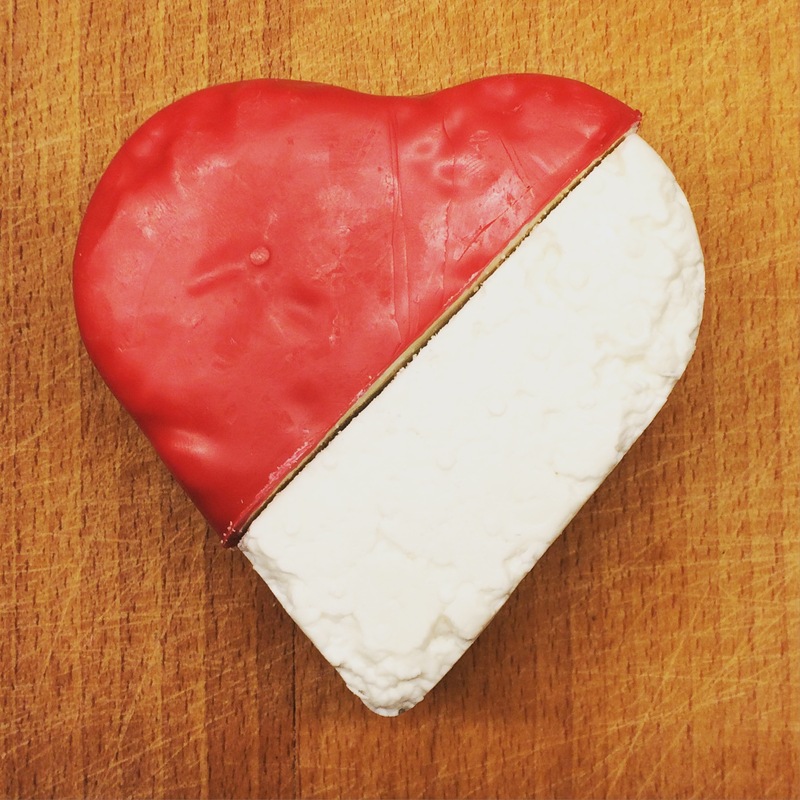 Do Re Mi is a soft, spreadable goat’s cheese that we all liked and Bogart is a semi-firm cow cheese that their website claims everyone loves, even a child. Derby certainly enjoyed it, but she is a natural turophile who lives for any cheese-tasting opportunities. We inhaled nearly all of the cheeses and then dug into some really nice local pizzas. It was a cheese-lover’s & locavore’s paradise of an afternoon. I look forward to more like this one! One little thing: last weekend, my camera got eaten by a Pacific wave, so my posts may have to be further delayed (than usual) as I look into replacing it. In the meantime, of course, I am surrounded my folks with camera phones, thus if I can find someone kind enough to snap a shot and send it to me, this approach also works. So, my thanks to Kefalotyri for taking this shot. One of the wonderful benefits of having a cheese blog is that people enthusiastically recommend cheeses, or better yet, BRING you cheese! Such is the case with today’s cheese, a goat’s milk cheese from a small farm in northern Norway. Aalan Gård (Aalan Farm) was founded in 1951 in the amazing-on-the-eyes Lofoten Islands. The farm makes 8 different cheeses and is home to over 200 goats that are milked twice a day. If you make a visit to the farm, you can even try your hand at milking a goat! 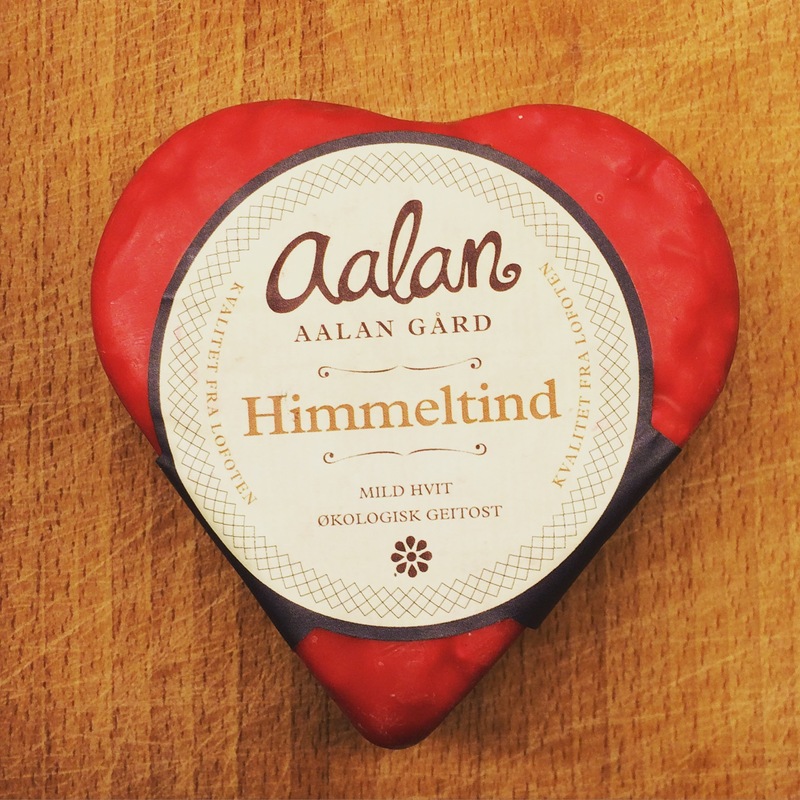 My fellow cheese-loving friend Carolyn discovered Himmeltind on a Hurtigruten journey to Lofoten. She liked it so much, she kindly brought back a chunk for me to try. A lovely red-wax covered, heart-shaped chunk at that! Himmeltind is semi-soft and has a short ripening period, so it has a very mild flavor as goat’s cheeses go. I personally loved the lack of tartness and smooth texture. It’s still a crumbly cheese, but doesn’t fall apart like other goat cheeses I’m used to. As the farm’s webpage mentions, this cheese is good as a cracker/bread/salad topping, or you can even cook with it. I’m envisioning a Himmeltind grilled-cheese in my future…maybe with some fig or apricot jam? However I eat it, I’m so happy to know about this beautiful cheese from my new homeland. A big thank you to Carolyn for this cheese discovery! I’m in LA for a long weekend, staying with my friends, the Sternschuppe family, and their youngest member, Jermi Tortes, took me out to explore the exciting sights of beautiful downtown Burbank. We stopped for a late lunch at The Melt, a small local burger joint. Fortunately, they also sell grilled cheese sandwiches, so I ordered one called The Italian Job. It features fontina, provolone, and mushrooms on garlic bread. I’m drooling just as I type those words and yes, it was good as it sounds. It was also quite messy, at least a five napkin sandwich! Two days later, we were back (besides The Melt, the fast-food options in Burbank aren’t stellar), and this time I decided to try their mac ‘n’ cheese. It was decidedly less good, so I didn’t even bother with taking a picture. The menu claimed it was a blend of aged cheddar, fontina, and jack cheeses and that the dish came topped with crispy onions. Now, I kinda wish I did have a photo for evidence because I definitely don’t remember anything crispy at all. There was a lot of cheesy sauce but it was on the less flavorful side. Maybe they make it mild for the kids, but it was disappointing. However, if you find yourself on the West-ish coast, The Melt has a smattering of locations in California and Colorado. So, if you are craving a cheesy experience, do stop in and try one of their grilled cheese, but steer clear of the mac ‘n’ cheese, unless you have a small child in tow. I must confess that it was a bit of a surprise that I had such wonderful cheese-centered experiences on my way out to LA this evening. I mean, one does not generally expect to encounter fine cheese at the airport, let alone on an airplane, but I guess my overlong stay at LaGuardia in August should have clued me in to the fact that the culinary experience in and around airports is not what it used to be. Tonight, I was flying out of JFK and it was right around dinner time. Since airplanes rarely provide free food anymore and really, when they do, it’s not that appetizing, I decided to get a sandwich to take on board with me. I found Bar Veloce at the end of the JetBlue terminal. There was a woman yapping away on her cell at their winebar, so I got my panino to go, and took it out onto the newly established smoke-free outdoor patio. I had selected the arugula panino featuring that green alongside the stringy fontina you see below and some chopped tomatoes. I did ask them to hold the red onions that usually come with it. I’m not overly fond of them and I think their strong flavor would have distracted me from the tastiness of the fontina. Well, a crosscountry flight is always longer than it seems it should be so after a few hours, that panino was bit a distant memory, and I needed another snack. I opened up the menu detailing the options available (for purchase) to passengers and was delighted to find a cheese & fruit plate from Beecher’s. It featured wedges of four of their handmade cheeses along with crackers, red grapes, honey, and I ordered an Angry Orchard cider to wash it all down. The cheeses included Beecher’s Flagship, Dutch Hollow Dulcet, Marco Polo, & No Woman. I had tried the Marco Polo before, but was happy to sample some of its peppery goodness again. The Flagship is the cheese that started it all and has an outstanding flavor. No Woman is an ode to Jamaican reggae with jerk spices blended into the cheese. Finally, the Dutch Hollow Dulcet is exclusive to the Beecher’s New York shop, as it’s made with milk from an Albany farm. I kept taking little bites of each trying to pick out their distinctions but they were all so delicious that I could never pick a favorite. 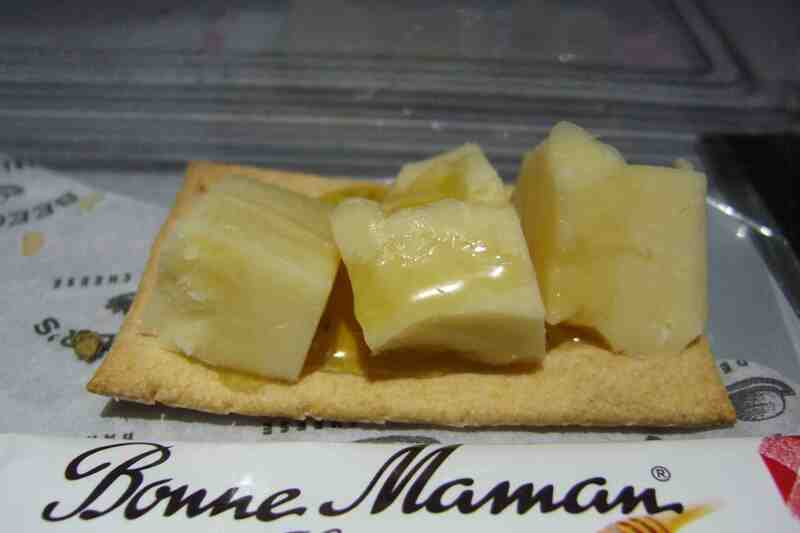 One of the last bites I enjoyed was the Dulcet drenched with some of the Bonne Maman honey–what a sweet combo! I do feel this second encounter with Beecher’s will spur me into making the trek into their New York shop, hopefully sooner than later. And when I do make it there, I promise to take lots of pictures and careful notes, too!